Medicare and Medi-Cal are statutory liens with an automatic legal right to repayment. 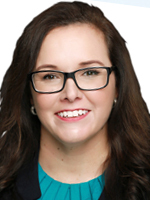 As an attorney, it is your duty to determine if there are any such liens. An attorney’s failure to pay these liens, even if unaware of their existence, can result in disciplinary action. (See California Standing Committee on Professional Responsibility and Conduct Formal Opinion 2008-175.) Don’t be that attorney. Do your homework, determine those liens that apply and make sure they get paid before you disburse funds to your client. The first obvious step in the process is figuring out whether your client is a Medicare or Medi-Cal beneficiary. And believe it or not, this is easier said than done because many people do not know or understand the type of plan they have. I suggest you ask your clients to provide you with a copy of their insurance cards. If the type of plan is not apparent on its face, contact the health plan to determine whether the plan is Medi-Cal, Medicare, ERISA, or private. 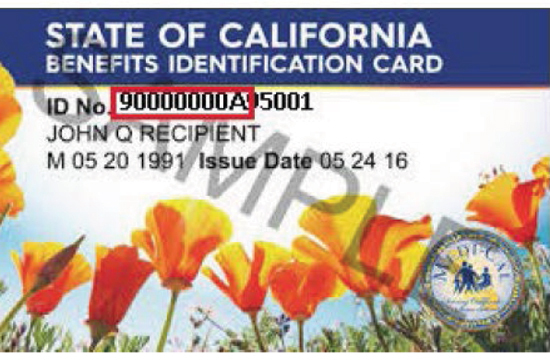 Once you identify a Medicare and/or Medi-Cal beneficiary, you must put the entities on notice of the claim. Medi-Cal requires that notice be given “within 30 days of filing the action.” (Welf. & Inst. Code, § 14124.73(a).) However, I have not come across a rigid deadline for providing notice to Medicare (other than before you disburse funds). 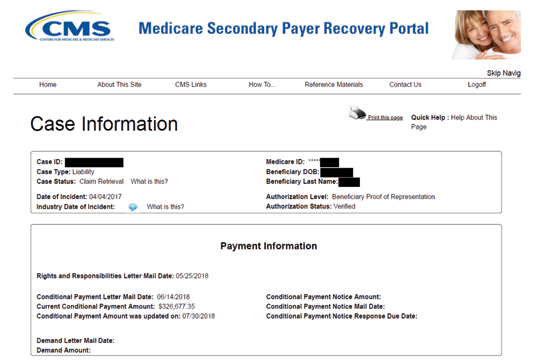 Once you receive the rights and responsibilities letter, you will have the CMS-assigned Case ID which you will need to access the Medicare Secondary Payer Recovery Portal (MSPRP). The MSPRP, unlike the Medi-Cal portal, requires you to register for access. Before a new user can register, the corporate or representative entity must complete the initial registration process for the MSPRP account. The registration process is cumbersome but well worth it once done. Submit Beneficiary Proof of Representation (POR), Beneficiary Consent to Release (CTR), and Recovery Agent Authorization requests and supporting documentation. Request an update on a conditional payment amount. Request an electronic conditional payment letter with Conditional Payment Amount (beneficiaries only). Request a mailed copy of the conditional payment letter. View/dispute claims included in a conditional payment letter and upload supporting documentation. Provide Notice of Settlement (NOS) information. Once registered and granted access to your client’s records, you will be able to instantly see the current conditional payment amount and the date on which the conditional payment was updated. This Case Information page will also allow you to view and request authorization, request updates to the conditional payment amount, request mailed copies of the conditional payment letter, begin the final conditional payment process, view and dispute claims, and provide settlement information. If you choose not to sign up for the MSPRP, all of this information is available by calling the BCRC, but it will require you, or someone in your office, to spend 10 or more minutes on the phone trying to get through to a representative. A word of caution, as set forth in the checklist provided, once a final demand letter is issued by Medicare, payment must be made within 60 days of the date of the letter or interest will be assessed. Interest begins accruing on the date of the letter, but it is not assessed unless and until payment is not received within those 60 days. If for some reason you do not receive the funds within that time, I recommend you submit a letter before the deadline explaining that the monies have not been received and requesting an extension of time to pay. (5) Contact information of any defense counsel representing the liable third party or insurer. Unlike the MSPRP, registration is not required to access the Medi-Cal portal. All you need is your client’s name and Medi-Cal ID number. 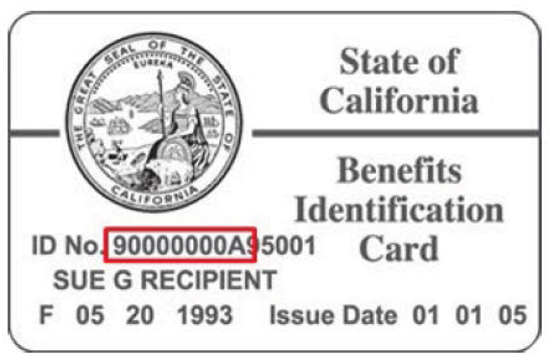 The ID number can be found on the member’s ID card and is comprised of the first 9 characters of the ID beginning with “9,” followed by 7 additional numbers, and ending with a letter. See exemplar benefits cards at right. Once you navigate to the online forms page, you will see links to the forms at the bottom of the page (screenshot of page at right). Start with Step 1 to provide notification. 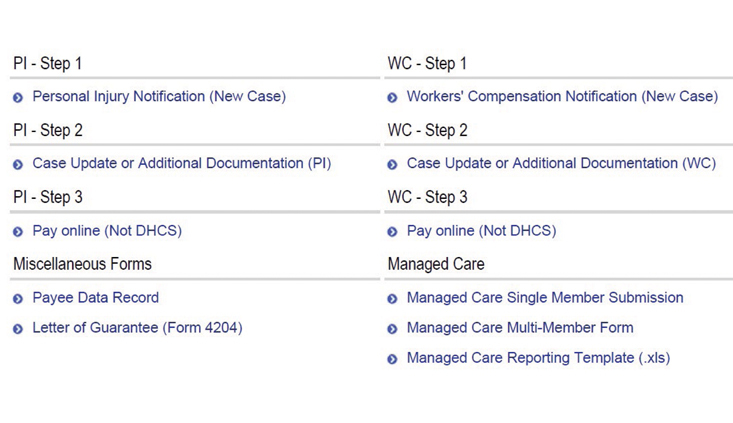 Then, use the Step 2 forms to provide case updates and provide additional information. Whatever you do, do not hit the enter button before you are done filling it out. If you hit enter, the form will be submitted albeit incompletely and you will have to start over. Before you hit enter or the submit button, print a copy of the form (send it to the printer or print to pdf) if you want to retain a copy for your file (which I highly recommend). If you fail to print the form, you will have no way of retrieving a copy of what you submitted. After you have printed the form and hit submit, also print a copy of the confirmation of successful transmission of the form. This confirmation is helpful to have for minors’ compromise hearings as proof of having provided notice. Once you are ready to request the final lien, whether it be because your client finished treatment related to the injury or because you settled, notify Medi-Cal immediately. Once you request the final lien, the Department waits 120 days before they begin gathering payment data to compile the lien. The reason? Providers have up to one year to bill for services, so the Department is trying to capture as much of the billing as possible. Once the Department starts gathering the payment data necessary to present the lien, if the beneficiary has managed-care Medi-Cal, it can take up to another 90-120 days for the Department to get the payment data from the HMO. If the beneficiary has straight Medi-Cal, the wait is usually only 30-45 days. Bottom line: Do not drag your feet in giving notice of the claim. Update the Department frequently on the status of your case and your needs for purposes of settlement. Checklists for use with Medi-Cal and Medicare liens can be found here.